Email marketing is often used to trigger impulse buying. Impulse buying works well for low-priced products. High-priced products and impulse buying don’t seem to be a good match at first, but are actually a great combination! So let’s learn more on how to successfully trigger impulse buying for high-priced purchases. In this article you will learn more about the customers that purchase high-priced items through examples. Impulse buying is an interesting dimension to add for this target group so therefore we give you four tips to successfully trigger impulse buying for high-priced purchases. When you’re looking for opportunities to improve revenue of the high-priced products buyers segment and increase their customer value, think about event driven email campaigns that could realize it. 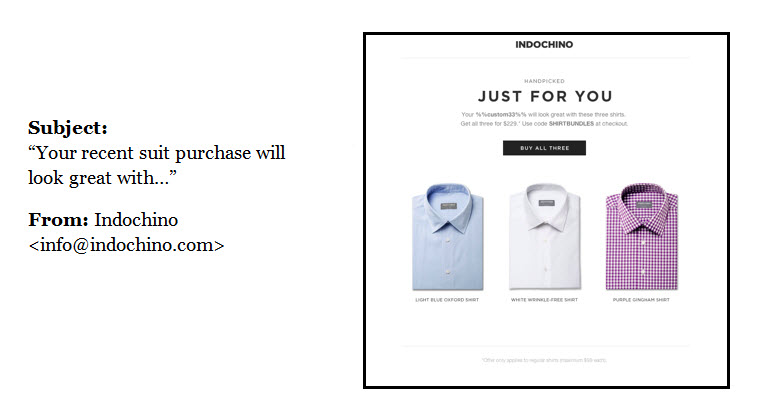 Here is an example of Indochino, a custom clothing site that successfully implemented email campaigns to trigger impulse buying. Customers who buy at Indochino sometimes take months before their actual first purchase. Needless to say Indochino wanted to build long-term relationships with their customers, leading to extra future sales after investing that time and effort to get the first sale. The company started the experiment with one of their most popular products, the Essential Grey Suit. Based on this purchase, the marketing team selected a bundle of three matching shirts. Four days after their purchase, the customers received an email. The result of this email marketing test was beyond expectations: the revenue per sent email was 540% above benchmark. Most companies have a mix of cheaper and more expensive products. The revenue often will come from a small group of premium product buying clients. At first sight, not quite the typical target group to get involved in impulse buying. However, there are some interesting opportunities to persuade these customers into the area of impulse buying. In its core, high-priced products and impulse buying don’t seem to be a good match. People who want to buy an expensive product, usually take many things into consideration before their purchase, e.g. ‘do I really want it?’, ‘do I need it?’, ‘can I get it cheaper/better anywhere else?’. These VIP customers are highly involved with their purchase. When they have carefully decided to buy at your company, you want to keep them close and build a relationship with them. That’s where impulse buying gets interesting. The above example from the clothing industry is pretty specific, but is applicable to many other industries as well. When you want to persuade customers to some impulse buying through triggered email campaigns, you can select products that will add value to their first purchase. In this example, when people just booked a holiday with their tour operator, give them the option for an upsell in the form of a discount for rental cars, discount on suitcases or discounted anti-mosquito spray. This demonstrates that you care about your customers’ needs and have thought about their user experience. You want to make sure they are completely satisfied with the travel, not just your product. This is a great way to build a long-term customer relationship. A good moment to start building a relationship with these customers is when they’ve made their first high-priced purchase. At this point they have positive associations with your brand and decided to buy from you. The ideal moment to get your customer lifecycle program going and get more out of the deal! You can even trigger customers to impulse buying when it comes to products that don’t support the original purchase. An example of a company who does this is a Dutch high-speed railway company NS Hispeed. When you want to go on a city trip, you have different kinds of transportation options to choose from. Traveling by high-speed train is one of the options. However, traveling this way isn’t the cheapest of travel options. Buying a high-speed train ticket will cost at least 100 euros where airplane tickets these days could be the same price or cheaper. When customers decide to travel by train, it’s important for NS Hispeed to build a relationship that could lead them back for future train visits. 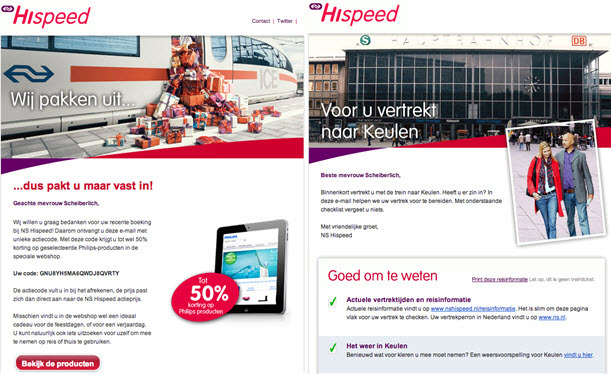 When customers buy a NS high-speed train ticket, NS Hispeed sends an email three days after their first purchase. Customers get 50% discount at the Philips webshop on a selected offer of household products as a thank you for their purchase. However, NS Hispeed doesn’t just try to get customers involved in impulse buying but builds relationships with its customers as well. 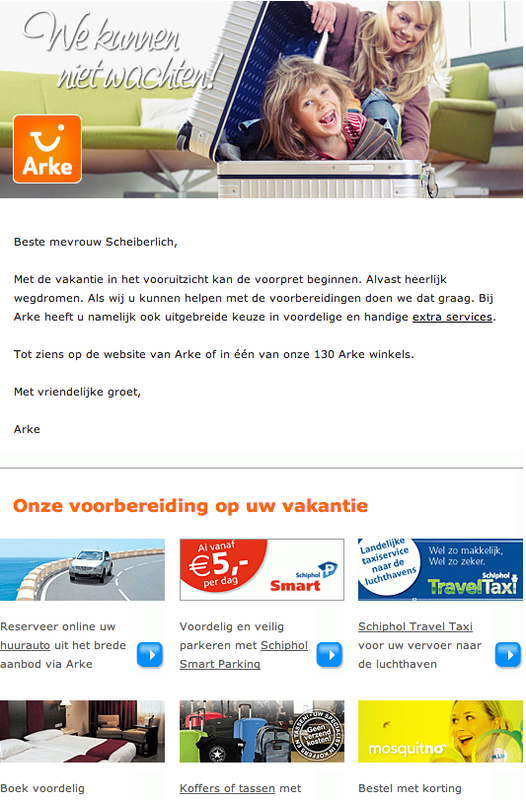 A day after the previous email customers receive another email with tips for their city trip. Create an automatic emailing system to ensure that the customer who purchased a high-priced product receives a newsletter with a special discount to a similar product after a predefined time. It saves you time (and money) and the recipient will surely be pleased with such a personal offer. Cherish the relationship with your buyers and only send relevant e-mails. Carefully selected products will trigger customers to revisit your website and make them think positively about you as a company. A bad selection of products could lead to the undesirable situation of people turning away from rebuying. Always address the customer with his/her name or specify the email is intended especially for them: ‘especially for you’. It will show them that you appreciate they’ve chosen for your company and you personally want to keep them informed about other interesting offers and information. There is a good chance customers will not want to make a new purchase shortly after their first purchase. However, when you apply the previous tips and only send relevant, personalized emails, customers will feel valued and you’re building a long-term relationship with them. So to be successful in promoting impulse purchases like in these examples, keep in mind that it’s important to set up automatic mailings, only send relevant emails, personalize your email and build a relationship with your customers. Charlotte is Content Manager at Hello Dialog. Hello Dialog is a Dutch email service provider (ESP) with over 12 years of experience in email marketing and works for clients such as Mkbasics, Basiclabel, 1DayFly, VVV Nederland en Rob Peetoom. Charlotte previously worked as a marketeer in the field of online marketing and obtained a Masters degree in Persuasive Communication at the University of Amsterdam.